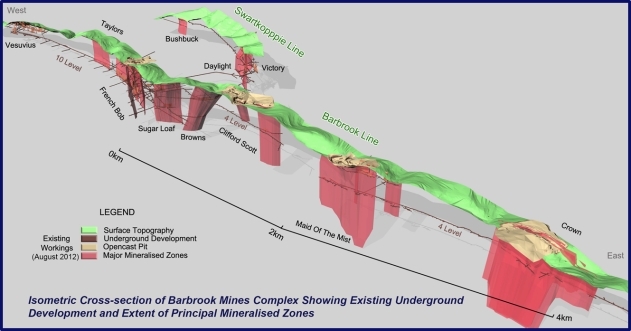 At least 10 known zones of gold mineralization occur within the Barbrook Mines Complex (“Barbrook”), a consolidation of deposits which collectively contain some 2.0 million ounces (14.52 Mt @ 4.60 g/t) in Mineral Resources. Ore Reserves containing some 45,700 ounces (0.24 Mt @ 4.08 g/t) have been delineated in the Taylors Mine area between underground Levels 7 and 10. Gold mineralization associated with shearing in these zones is primarily BIF-hosted and has been mined to a relatively limited extent in the past from steeply plunging ore shoots. Secondary mineralization also occurs in greenschist adjacent to the BIFs. Shearing is primarily concentrated along two parallel faults of regional extent, known colloquially as the Barbrook and Zwartkoppie Lines. The ore bodies along the Barbrook Line are aligned along a succession of BIF/chert and meta-volcanic lithologies. On the Zwartkoppie Line, a series of tight folds with sub-vertical fold axes form the foci of mineralization within intercalated schist, chert and BIF host rocks. Barbrook has a well-established surface infrastructure (plant, workshops, laboratory, tailings dam, etc. 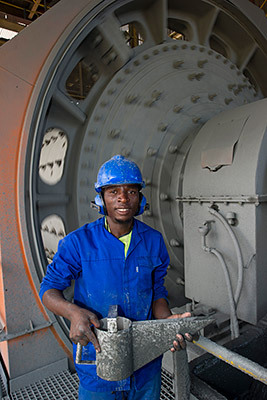 ), extensive underground development (>50 km) and readily accessible areas for mining. No ore extraction and very little exploration have been undertaken to date below 10 Level. Access to the main underground sections is via two equipped adits, respectively on 7 and 10 Levels, which are separated by 150 vertical meters. No development exists below 10 Level, which is at the surface elevation of the CMC. All ancillary utilities are operational. The Company has commenced mining at Barbrook in two stages. The first (Taylors Mine – Barbrook Stage 1) is a trial mining and processing operation that produces float concentrates from underground mining. The Barbrook Stage 2 expansion, which is being investigated by way of a Bankable Feasibility Study (“BFS”), will be a major, phased expansion of gold production. The success of the Stage 1 project has paved the way for commencement of the Barbrook Expansion Plan (Stage 2) in 2014. The Company’s strategy is to convert as many of the existing Mineral Resources into Ore Reserves as quickly as possible – in so doing to ultimately expand production from 15,000 oz/annum to a planned 50,000 to 60,000 oz/annum. The BFS detailing the full expansion plan is due to be completed in 2014. 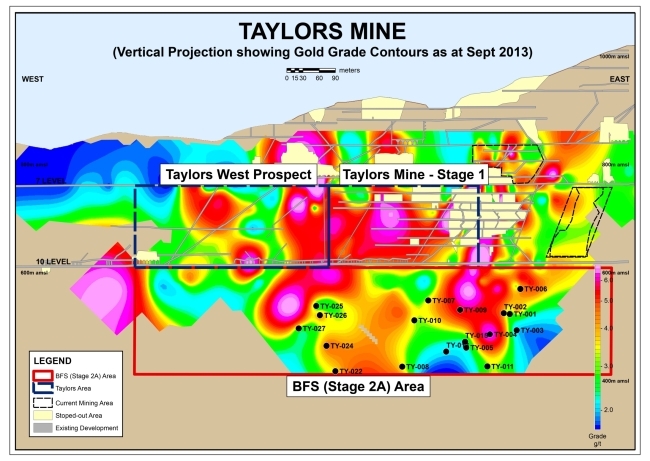 Following the positive results of a BFS, some $3 million of the capital raised in the April 2011 Private Placement was used to fund the underground development at the Taylors Mine section of Barbrook. As Barbrook’s refractory ores have a history of poor metallurgical recoveries using conventional processing methods, the objective of the Taylors trial mining was to de-risk the project as far as possible. The production of flotation concentrates was, therefore, originally sold in terms of an Off-take Agreement which the company had with a London-based metals trader. This Agreement was cancelled in November 2012, necessitating the processing of the concentrates on site, initially by blending them into the Lily Mine leaching circuit but later by treating them in a separate CIL circuit. Metallurgical recoveries from direct leaching have been relatively low to date but, with the staged introduction of additional leach tanks and application of the HiTeCC process, recoveries are increasing and expected to reach planned levels. BIOX® pilot-plant test work was also completed as part of the Stage 2 BFS, demonstrating that Barbrook’s refractory ores are amenable to BIOX® treatment. 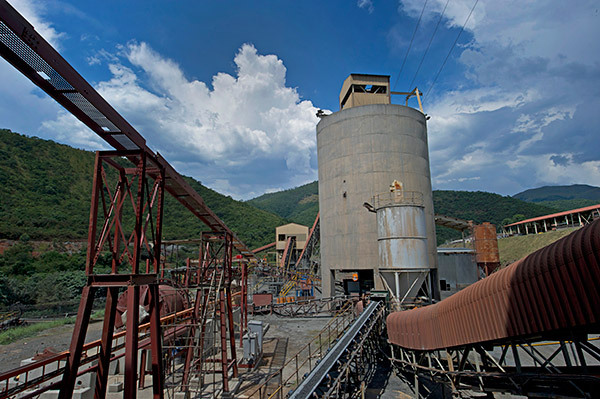 The results of BIOX® pilot plant metallurgical test work indicate that leach gold recoveries from concentrates in excess of 80% can be achieved after BIOX® treatment. However, with the addition of the HiTeCC processing step to treat the CIL residues after bioxidation, leach recoveries are expected to be enhanced to at least 90%. Of relevance to the eventual flow sheet selection for the Barbrook Stage 2 BFS is whether the present, production-scale treatment of concentrates in the CMC will prove to be economically preferable to BIOX®. Current investigations aim to eventually bring the overall flotation and leach recoveries in the Barbrook direct leach circuit to 70%. The underground diamond drilling program currently being undertaken from 10 Level is designed to upgrade existing JORC mineral resources in the down-dip extension of the Taylors and French Bob ore bodies. Results of the drilling continue to confirm mineralized extensions of these ore bodies below 10 Level, particularly to the east of the known pay shoots. By end September 2013, some 6,000m of the planned 8,000m of core drilling had been completed.